John Z. M. Hinshaw7,8,9,10,11 [John Murrel Hinshaw6]. 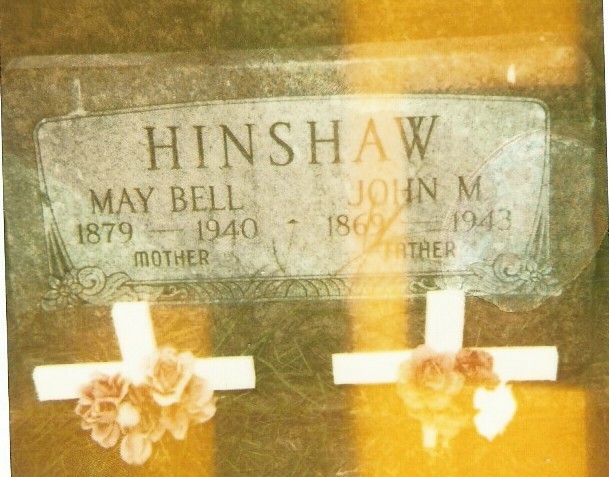 Hinshaw, John J.M., head-of-household, age 31, born Jan 1869 in Illinois; parents born in Illinois; married 3 years; occupation: farmer; rented farm. Hinshaw, May B., wife, age 21, born Apr 1879 in Illinois; parents born in Ohio; married 3 years; 1 child, 1 living. Hinshaw, Walter L., son, age 2, born Mar 1898 in Illinois; parents born in Illinois. Livingston, Sallie A., mother-in-law, age 51, born Aug 1848 in Ohio; parents born in New York; widow; 7 children, 7 living. Livingston, Lillie E., sister-in-law, age 25, born May 1875 in Illinois; parents born in Ohio. Livingston, Ida I., sister-in-law, age 15, born July 1884 in Illinois; parents born in Ohio; attended school. Hinshaw, John M., head-of-household, age 41, born in Illinois; parents born in Illinois; first marriage, married 13 years; occupation: grainkeeper, elevator; owned home (free). Hinshaw, Mabell, wife, age 31, born in Illinois; parents born in Ohio; first marriage, married 13 years; 4 children, 4 living. Hinshaw, Walter L., son, age 12, born in Illinois; parents born in Illinois. Hinshaw, Harry S., son, age 9, born in Illinois; parents born in Illinois. Hinshaw, Clarence V., son, age 6, born in Illinois; parents born in Illinois. Hinshaw, Merle O., son, age 2, born in Illinois; parents born in Illinois. Wade, Erwin N., head-of-household, age 33, born in Illinois; owned home; farmer. Wade, Minnie R., wife, age 31, born in Illinois. Wade, John P., son, age 6, born in Illinois. Hinshaw, John, head-of-household, age 50, born in Illinois; father born in Illinois; mother born in Ohio; rented home; farm laborer. Hinshaw, May B., wife, age 40, born in Illinois; parents born in Ohio. Hinshaw, Harry S., son, age 19, born in Illinois; parents born in Illinois; occupation: farm laborer. Hinshaw, Clarence C., son, age 15, born in Illinois; parents born in Illinois; attended school; farm laborer. Hinshaw, Merril O., son, age 12, born in Illinois; parents born in Illinois; attended school. Hinshaw, Lenora B., daughter, age 8 years 3 months, born in Illinois; parents born in Illinois; attended school. Hinshaw, Francis C., son, age 6 years 5 months, born in Illinois; parents born in Illinois; attended school. Hinshaw, Lillian M., daughter, age 4 months, born in Illinois; parents born in Illinois. Hinshaw, John M., head-of-household, age 61, born in Illinois; parents born in Illinois; first married at age 28; owned home; radio in home; occupation: laborer, inst. farm; not a veteran. Hinshaw, May Bell, wife, age 50, born in Illinois; parents born in Ohio; first married at age 18. Hinshaw, Murrel, son, age 22, born in Illinois; parents born in Illinois; occupation: laborer, railroad section. Hinshaw, Frank, son, age 16, born in Illinois; parents born in Illinois; attended school. Hinshaw, Lillian, daughter, age 11, born in Illinois; parents born in Illinois; attended school. Livingston, Bobby, boarder, age 4 years 5 months, born in Illinois; parents born in Illinois. Hinshaw, John, head-of-household, age 71, born in Illinois; completed 6th grade; on Apr 1 1935 was living in the same house; owned home ($500 value). Hinshaw, Mabel, wife, age 61, born in Illinois; completed 4th grade; on Apr 1 1935 was living in the same house. Livingston, Robert, lodger, age 14, born in Illinois; completed 8th grade; on Apr 1 1935 was living in the same house; attended school. 1900 census, Eppards Point Township, Livingston County, Illinois; roll T623-318, ED 98, page 9B, line #89, dwelling #171, family #173. 1910 census, Eppards Point Township, Livingston County, Illinois; roll T624-303, ED 24, page 98B, line #91, dwelling #130, family #132. Livingston County, Illinois, Farmers Directory, 1917; http://www.ancestry.com. 1920 census, Eppards Point Township, Livingston County, Illinois; roll T625-383, ED 25, page 5B, line #87, dwelling #92, family #124. 1930 census, Eppards Point Township, Livingston County, Illinois; roll T626-533, ED 13, page 6A, line #47, dwelling #122, family #122. 1940 census, Eppards Point Township, Livingston County, Illinois; roll T627-837, ED 53-16, page 6A, line #10, household #98. World War I Draft Registration Cards, 1917-1918; http://www.ancestry.com (son Harry). 1940 census, Eppards Point, Livingston County, Illinois; roll T627-837, ED 53-16, page 6A, line #10, household #98.